Hunger Is, a joint charitable campaign of The Safeway/Tom Thumb/Randalls Foundation and the Entertainment Industry Foundation, raises public awareness and funds to end childhood hunger in the U.S. The Texas No Kid Hungry Campaign has received a $38,000 grant from Hunger Is to help solve childhood hunger. Texas No Kid Hungry, a statewide branch of the campaign led by Baylor University’s Texas Hunger Initiative, was nominated by the managers of Texas Tom Thumb and Randalls stores, and funds were made possible by their customers who contributed generously during a month-long in-store fundraiser this spring. Hunger Is, the joint charitable program of The Safeway/Tom Thumb/Randalls Foundation and the Entertainment Industry Foundation (EIF) featuring Academy Award®-nominated actress and Hunger Is Ambassador Viola Davis, raised more than $4.6 million to eradicate childhood hunger from shoppers throughout 1,300 Safeway family of stores across the U.S., as well as through online contributions. Through local grants, Hunger Is allowed the local stores to identify an organization to receive the grant to help make a difference in their own community. The $38,000 Hunger Is grant to Texas No Kid Hungry will go toward feeding children in the local community living in households that struggle to provide sufficient and healthy meals, including supporting daily school breakfast. Studies have shown that eating breakfast can improve a child’s attention span during school and lead to an increase in standardized test scores. Three out of five elementary and middles school teachers say they regularly see students come to school hungry, a statistic Hunger Is seeks to end. 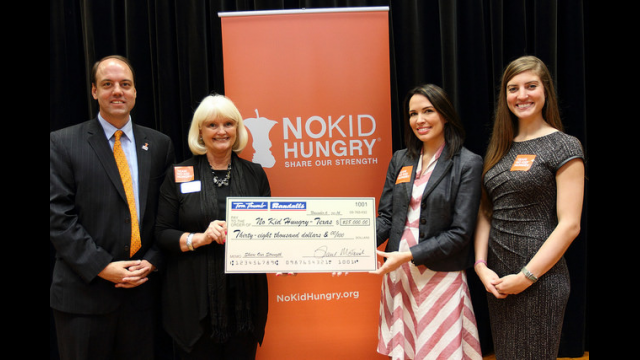 “It’s a great honor to receive this Hunger Is grant and the recognition of the Tom Thumb and Randalls store managers for our work,” said Loretta Landry, No Kid Hungry regional coordinator at the Texas Hunger Initiative – Dallas Regional Office. “Making sure the children in our community have the necessities to succeed is so important and this grant will make a difference. We thank everyone who paused in their shopping routine and took the time to think about the children in need in our community.” On Nov. 6 in Dallas, Connie Yates from Tom Thumb/Randalls joined Landry, leaders from the Dallas Independent School District, community organizations, elected officials and the national No Kid Hungry campaign to celebrate the tremendous success of the school district, which connected more kids with the healthy breakfast they need to succeed. “It was so remarkable to see the Dallas ISD and No Kid Hungry breakfast program in action,” said Yates, director of public relations for Tom Thumb/Randalls. “It’s so rewarding to know that our $38,000 grant will provide 380,000 breakfasts statewide to Texas school children so they can start the day well nourished.” To learn more about the fight against childhood hunger and to donate to the cause, visit www.HungerIs.org. Hunger Is, a joint charitable program of The Safeway Foundation and the Entertainment Industry Foundation (EIF), is designed to build awareness and raise funds in an effort to eradicate childhood hunger in America. Funds raised through Hunger Is Is directly benefit programs focused on combating childhood hunger and improving health-related outcomes. For more information, visit HungerIs.org. ABOUT THE SAFEWAY FOUNDATION Founded in 2001, The Safeway Foundation supports causes that impact our customers' lives. Safeway stores provide the opportunity to mobilize funding and create awareness in our neighborhoods through the generous contributions by our customers, our employees' passion and partnerships with our vendors. We focus on giving locally in the areas of health and human services, hunger relief, education and helping people with disabilities. Safeway Inc. and The Safeway Foundation have invested $1 billion in our neighborhoods since 2001. For more information about The Safeway Foundation, visit www.safewayfoundation.org. No child should grow up hungry in America, but one in five children struggles with hunger. Share Our Strength's No Kid Hungry® campaign is ending childhood hunger in America by ensuring all children get the healthy food they need, every day. No Kid Hungry connects kids in need to effective nutrition programs like school breakfast and summer meals and teaches low-income families to cook healthy, affordable meals. This work is accomplished through the No Kid Hungry network, made up of private citizens, public officials, nonprofits, business leaders and others providing innovative hunger solutions in their communities. Join us at NoKidHungry.org. Baylor University is a private Christian University and a nationally ranked research institution, characterized as having “high research activity” by the Carnegie Foundation for the Advancement of Teaching. The University provides a vibrant campus community for approximately 16,000 students by blending interdisciplinary research with an international reputation for educational excellence and a faculty commitment to teaching and scholarship. Chartered in 1845 by the Republic of Texas through the efforts of Baptist pioneers, Baylor is the oldest continually operating University in Texas. Located in Waco, Baylor welcomes students from all 50 states and more than 80 countries to study a broad range of degrees among its 12 nationally recognized academic divisions. Baylor sponsors 19 varsity athletic teams and is a founding member of the Big 12 Conference. The Texas Hunger Initiative (THI) at Baylor University is a capacity-building, collaborative project, which develops and implements strategies to end hunger through policy, education, research, community organizing and community development. THI works to make the state food secure by ensuring that every individual has access to three healthy meals a day, seven days a week. THI convenes federal, state and local government stakeholders with nonprofits, faith communities and business leaders to create an efficient system of accountability that increases food security in Texas. Headquartered at Baylor University, THI has 12 regional offices located in Amarillo, Austin, Dallas, El Paso, Fort Worth, Houston, Lubbock, McAllen, San Angelo, San Antonio, Tyler and Waco.